The HOT HOT HOT race and that was not just the weather. 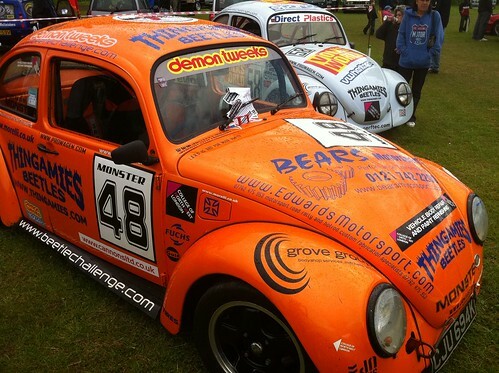 A welcome return to the Beetle Challenge for Trigger (Paul Oldfield) His return did have a bit of a twist though as he was in Simon Sergides car! The other competition being from Phil Thompson, Steve McGillvray and regular competitor Dave Charlton. 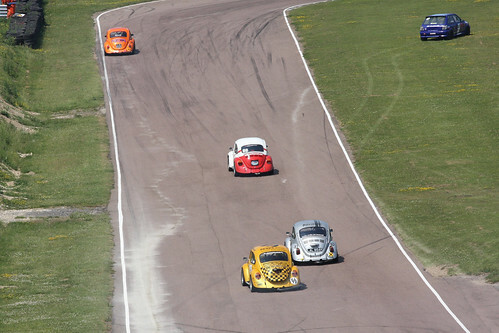 Because of the extreme heat all four drivers were concerned about their precious air cooled engines however this thought obviously went straight from their minds when they got onto the circuit. Qualifying resulted in Dave 53.894 Trigger 53.952 Steve 56.038 and Phil 1.03.873. 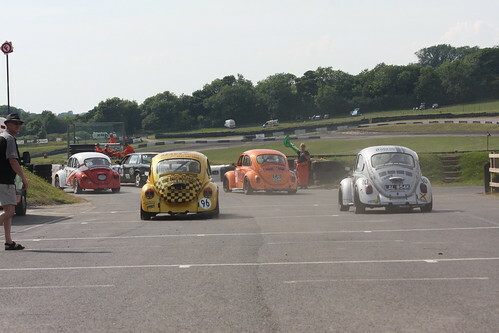 On return to the pits three cars were in one piece but Dave’s normally reliable beetle had a broken exhaust and he said he had only had 3rd and 4th gears most of race and this was the reason he had gone off because he had been unable to change down. Despite this he remained only 2 seconds off his qualifying times. As is the case with racing all hands to the deck and a Blue Peter repair was done to the exhaust. Nothing could be done about the gears but Dave said he would start the race and see how far he could go! Check out the videos of the day to confirm this was hot hot hot racing. 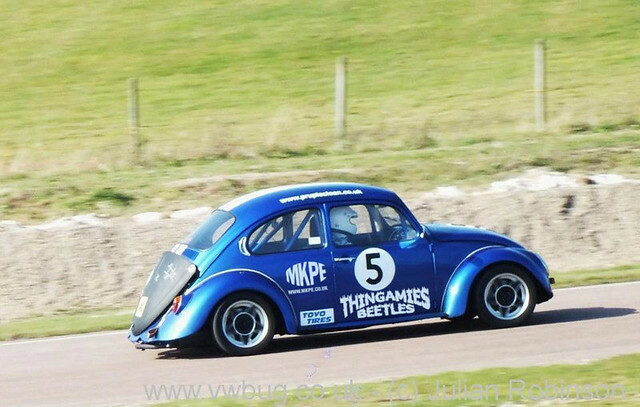 This weekend saw three cars out Dave ‘The Bandit’ Charlton, Nick ‘The Vicar’ Whitty and Steve ‘Cookie’ McGillivray with qualifying and Race 1 on Saturday and Race 2 on Sunday. An added bonus being qualifying and each race would be 20 minutes. 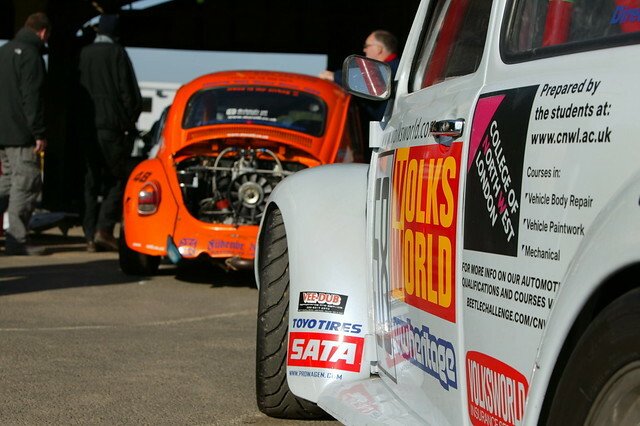 Considering Mallory consisted of three 10 minute sessions on track this was going to be a real test of reliability. All of them passed with flying colours. 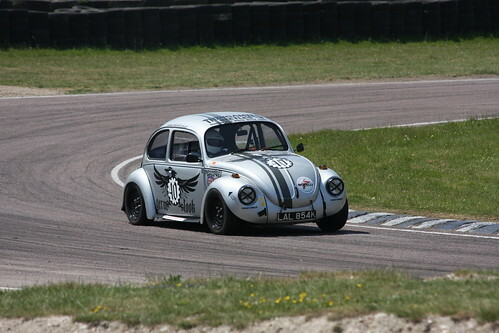 Dave qualified in front with a 1.03.638 The Vicar second with 1.07.049 then Cookie with 1.10.710. This was Cookie’s first time out on the Brands track which is always somewhat daunting and a very full grid of 31 cars to contend with as well. The Vicar’s second visit here saw him take 2 seconds off his qualifying time from his first visit back in March. 22 Laps in Race 1 saw Dave take yet another win with a fastest lap time of 1.04.041 The Vicar and Cookie had a good battle resulting in Cookie taking second place from The Vicar whose car appeared to develop a miss-fire. Cookie was obviously getting comfortable with the track as his best lap was a 1.07.410 and Nick’s 1.07.304. This was an excellent achievement for all of them as the circuit was busy to say the least. 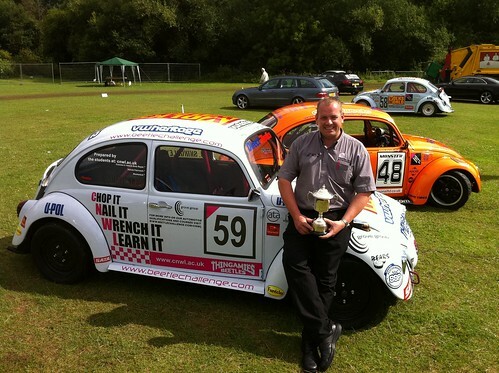 The successful weekend also saw Cookie taking the award for best prepared car. 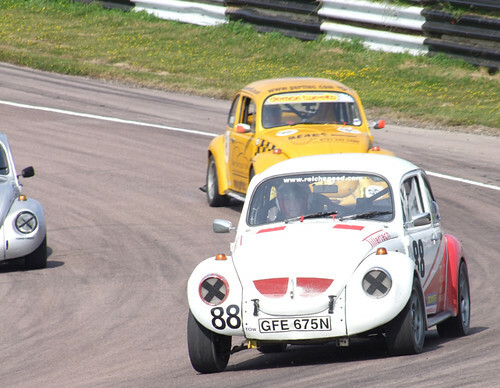 So with these three cars finishing the weekend with no major problems we look forward to Lydden on 27th June and the promise of other cars to join them. 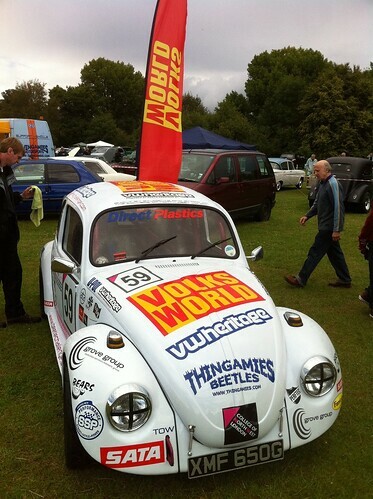 Unfortunately a race where there was only one Beetle flying the flag. 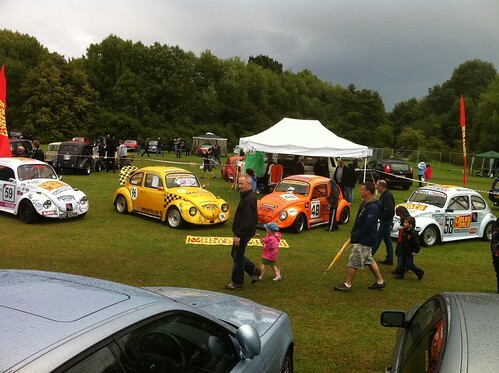 The forecast said it was going to rain and as the two races of the day for the Tin Top class were 15.45 and 18.00 it was pretty much guaranteed to be wet. Dave Charlton braved the day and sure enough just as qualifying started so did the rain. The track turned to grease very quickly and so having done the necessary laps needed he decided job done and with a 1.35.605 (which was faster than he had previously done at this circuit last year on a dry track) came in and hoped for dry weather later in the day. 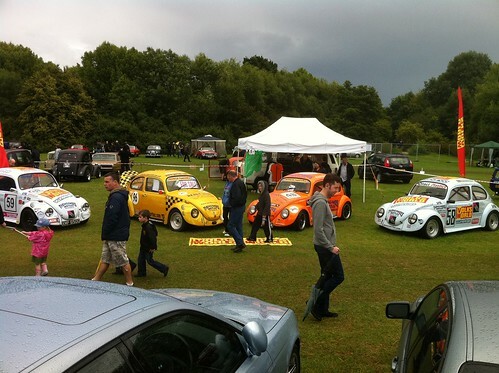 But it rained some more and was very very wet for the first race. 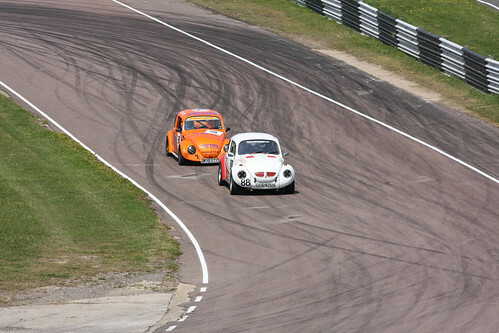 This resulted in many cars having interesting racing lines and falling off the track altogether. Times were more than 10 seconds slower per lap than in qualifying! 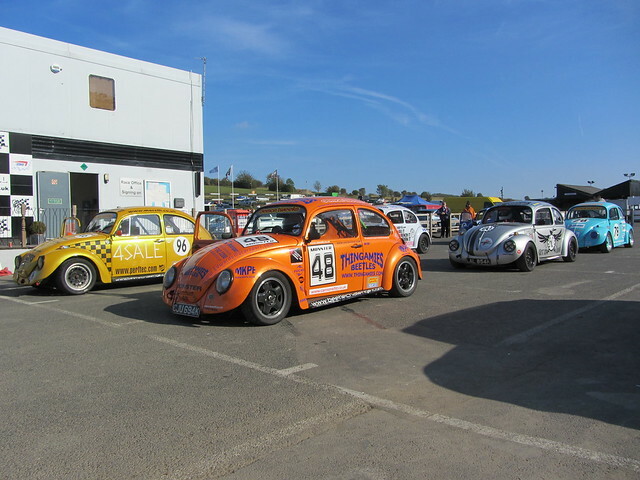 Dave survived the race however he had taken an opportunity to try a new development part today but he was not completely happy with its performance and so took the decision not to run in the second race. 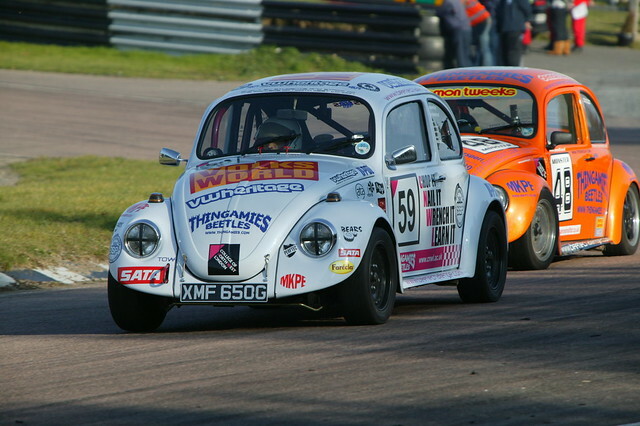 As a word of warning many drivers were reprimanded during the day for not keeping within the white lines of the circuit. Apparently all circuits are clamping down on this and will take a hard line on violation so be warned. 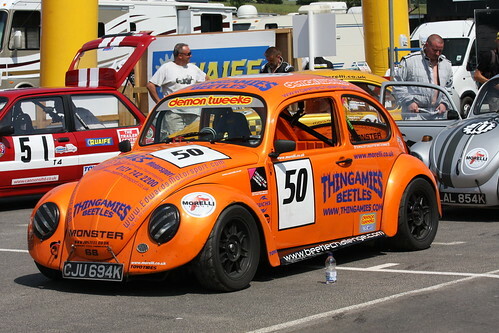 Brands Hatch next so let’s see some more Beetles giving Mr Charlton some competition. 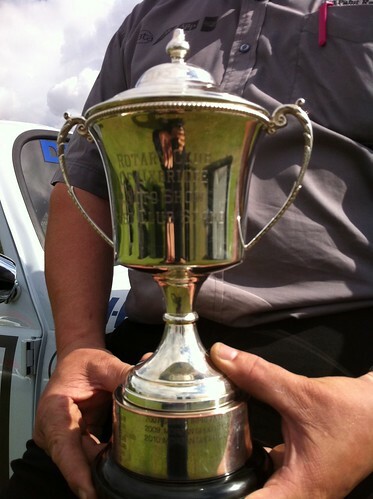 Toil and Trouble – Joy and Frustration ——— Result = Good Days Racing with Records Set! 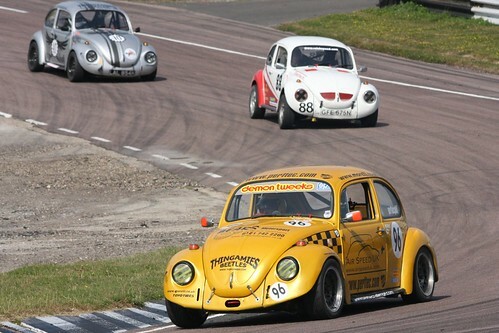 That’s how the first televised Beetle Challenge Race could be summed up. 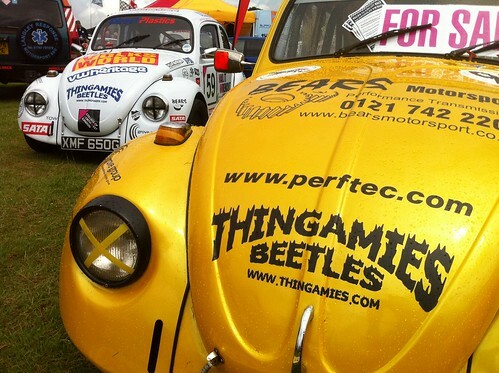 7 Beetles on the grid – That’s a record! This was only achieved by many many hours hard labour – That’s Toil and Trouble! 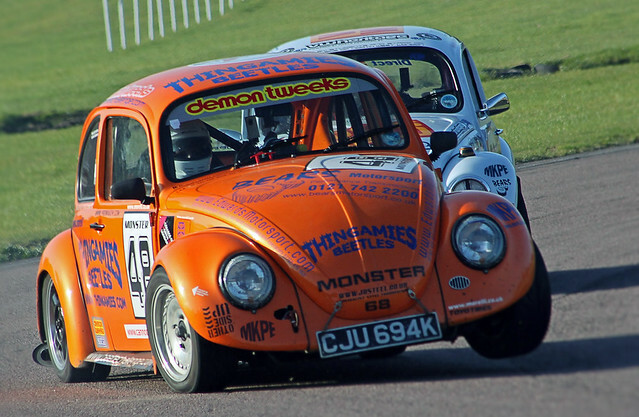 Normally Dave ‘The Bandit’ Charlton’s reliable beetle finishes in top spot but today it was Simon ‘Monster’ Sergides who took a win in both races. Dave qualified ahead of Simon their times being 1.01.268 and 1.01.317. This was going to be a very close battle especially with them both having that desire to beat each other. Simons 2.1 was just too much for the 1600 of Dave’s on the straights and despite Simon’s interesting racing lines he took the win in race 1 (That’s being very kind! - Have Novice Cross Sticker and is prepared to use it erratically!!! ). Being ahead on the grid for race 2 should have made Simon’s job easier however Dave stuffed it up the inside on the first bend into Gerrards, and took the lead but again the straight line speed of Simon meant he took the lead back after a bit of a dogfight. 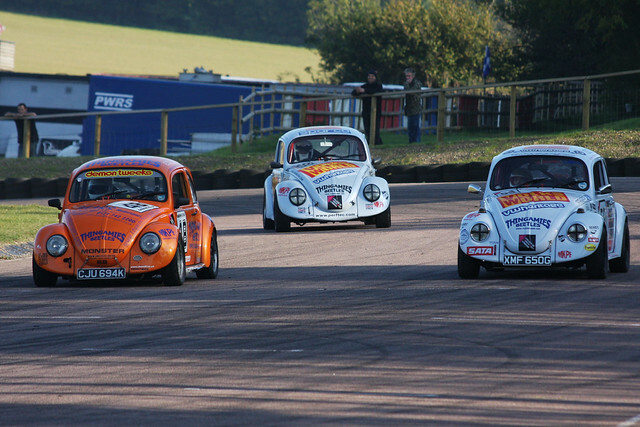 There was a great moment when Dave and Simon went either side of Florence in his No 98 Bug on Gerrards.. three abreast on the fastest corner!!! However it was still not over, Simon had an incident! at Gerard’s resulting in Dave having to take avoiding action and reverting to rally mode but actually ending up facing in the wrong direction. He managed to get back on the track and continue. Simon by now was way in the distance but Dave was gaining on him all the time and when he had caught and passed him it was assumed Simon had some sort of problem. Suddenly Simon was back on the pace with the lead once again changing. There was a real race going on between the two of them and Simon took his second win of the day. Questioned on the possible problem with lack of power after his incident Simon disclosed his strategy! (which for sure F1 teams will implement?) Quote “I was waiting for Dave to catch up so we could race!!!!!!!!!!!!!!!!) - That’s Joy and frustration! Nick ‘The Vicar’ Whitty completed without any real problems and ever improving times. 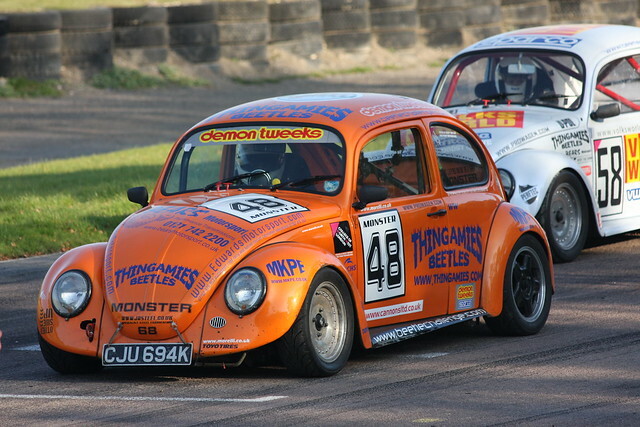 There was a momentary blip when he was called for to the Clerk of the Course… but it turns out they needed car No.1 not Nick in Car No.11… Phew… Maybe this accounts a little for his improved times in race 2, as clearly he had lost some excess weight having crapped himself! Nick only did one spin this race too.. and didn’t caress the tyrewalls this time (even though he has an obvious fetish for rubber)… so that’s progress. As with last time Nick was out this is one to watch out for in the future. He received notification of his prize via txt, as he had just that moment left the circuit, and Simon collected it on his behalf… then a traffic jam on the M1 allowed Nick to peg it down the hard shoulder on foot and grab the Champers! Aswell as removing one of Simon’s socks and lobbing it into the abyss of the hard shoulder - very funny!… but not as funny as the stealth return which is the other stinking sock which now resides in the Naca Duct which feeds Nicks face with - not - fresh air anymore - poetic justice me thinks! 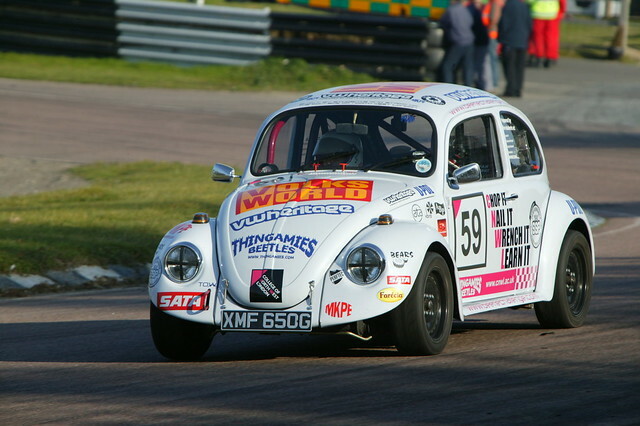 Craig ‘Grandpa’ Winfield unfortunately was off the pace he had hoped for despite a change of gear box from last time out. 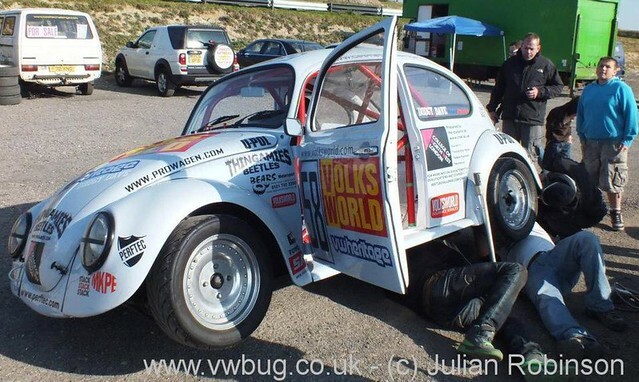 In race one the Rotor Arm went kaput.. a 15second fix that blew his entire race - gutting. The race two unearthed some misfire issues which ultimately ended in another DNF. As always this car is turned out immaculately, and he should have definitely been on the pace at the front of the Class, but his day was ultimately– Frustration! Phil ‘PerftecPhil’ Thompson was producing the ash cloud! And was asked to exit the circuit in race 1 (Made for some hilarious commentary on Live TV… Naughty Naughty.. ). He had a better run in race 2 but slowed the pace for the last few laps when the ash cloud threatened to re-appear. Prior to this he was putting in respectable times. – That’s Joy! 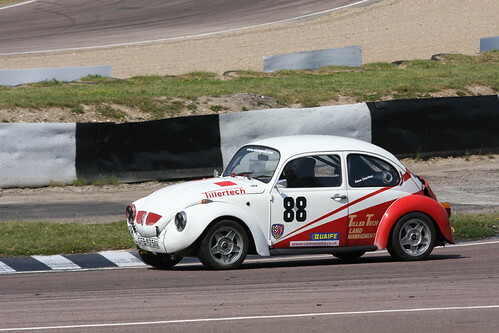 Lawrence Butcher was the only beetle that tested on the Saturday which turned out to be a useful exercise as it uncovered a couple of problems which would have definitely ended his day in qualifying. This enabled him to resolve for race day and he completed qualifying with consistent times. His races were a little more frustrating however, his rocker gear came loose in race one! and he has some work to progress with for next time. His day was topped off, when he saw the TV coverage and got a Name Check on from the commentators, ‘Florence‘ Butcher… (Something to do with driving like a girlie apparently! LoL!!) On the whole – That’s Joy and Frustration! There is plenty of in car camera footage to check out shortly, plus the Motors TV coverage will be repeated together with access to DVDs. 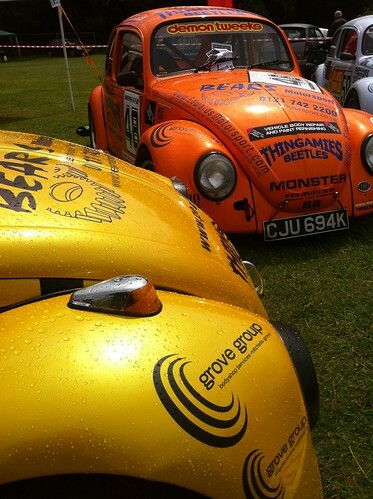 Only one Beetle was flying the Beetle Challenge flag at Cadwell Park, which is a shame as it was truly a lovely summer day at the Park. 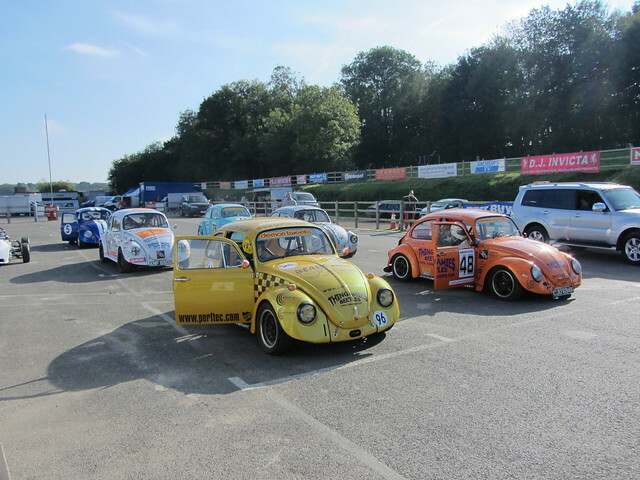 The Tin Top class was amalgamated with the Tigers to make up numbers and everyone who made the epic journey all the way to Cadwell said it was well worth the trip. However the constant rollercoaster effect of this unique circuit meant that many of the drivers actually felt sick! 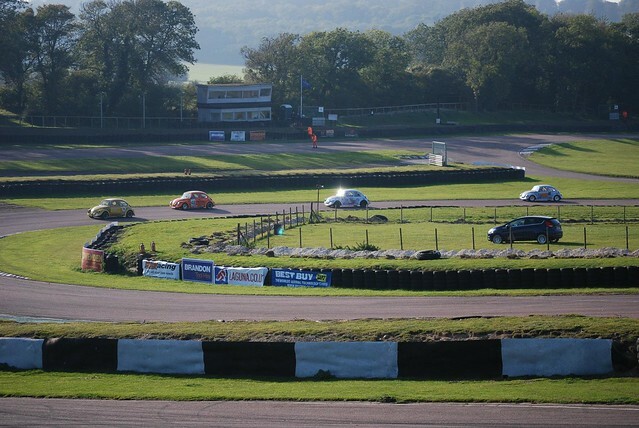 So a warning to you all, take a travel sickness tablet before taking on this circuit. 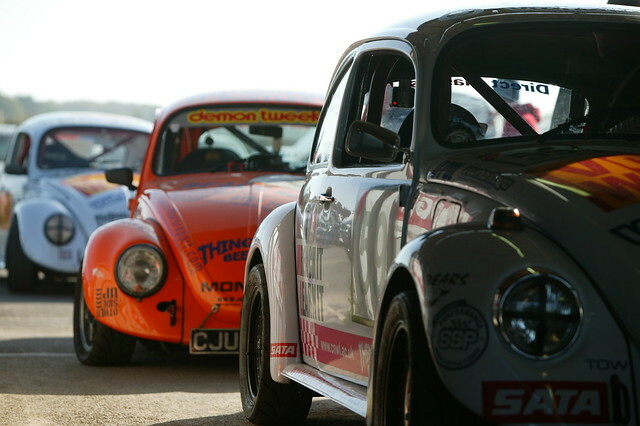 Because of the amalgamation of classes this meant there were 25 minutes qualifying and two 20 minute races. So you really did get value for money both as a driver or spectator. 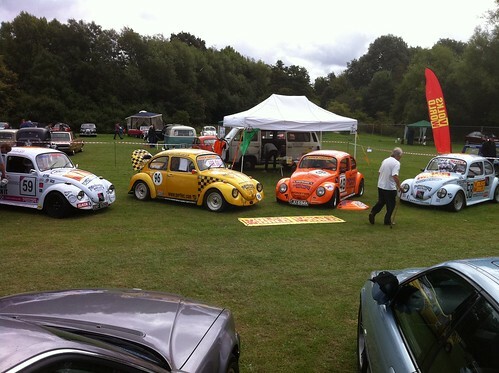 As the only Beetle entry Dave Charlton in his ex rally 1600 beetle had to find other cars to do battle with and so Dominic Ryan in his Ford Fiesta 1596 and Jon Wild in his Rover Metro 1598 were his targets for the day! 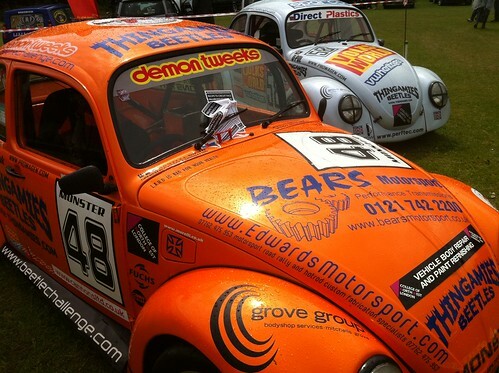 Dave and his reliable little beetle should have been at home on this track having done many a rally together at Cadwell in a previous life, however his qualifying times were rather erratic. He managed a fastest lap of 1.54.682 against Dominic’s 1.55.337 and Jon’s 2.02.453. Unfortunately Jon’s metro had a major smoking problem and he had to pit quite early in the session. Dave’s experience on this circuit obviously paid dividends against Dom’s fiesta. Unfortunately for Jon his temporary fix became a terminal problem and his race ended on lap 5. 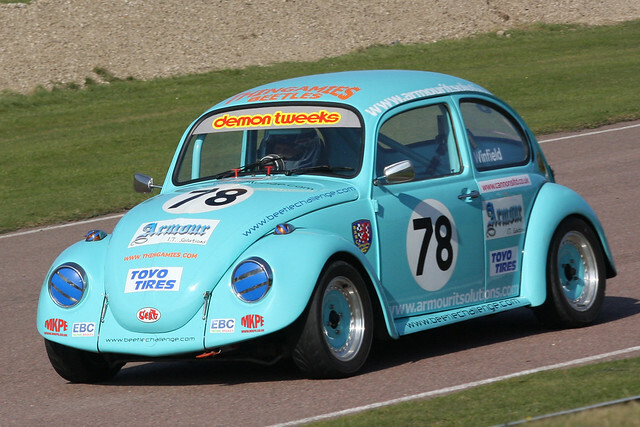 Dom actually managed to pass Dave resulting in a question of “Is the beetle developing a problem” Their fastest laps now being Dom at 1.54.350 and Dave at 1.56.419. 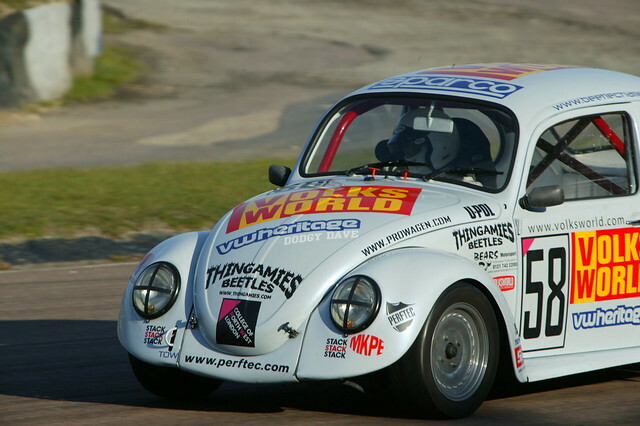 The beetle finished fine and so took a Beetle Challenge Class Win. 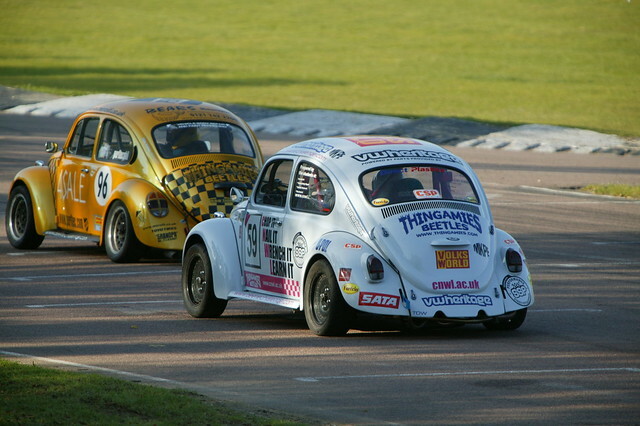 Race 2 proved to be most entertaining with the beetle almost touching the rear bumper of the fiesta the whole race. 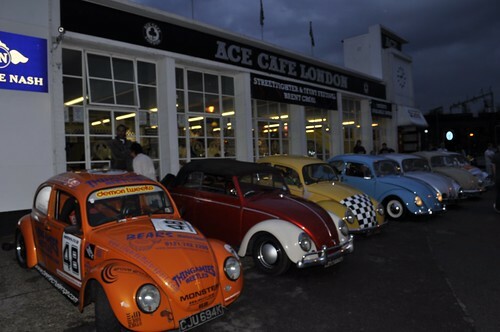 Despite the fact that the beetle only needed to finish again to take another win in the beetle challenge Dave was definitely not going for a safe completion. 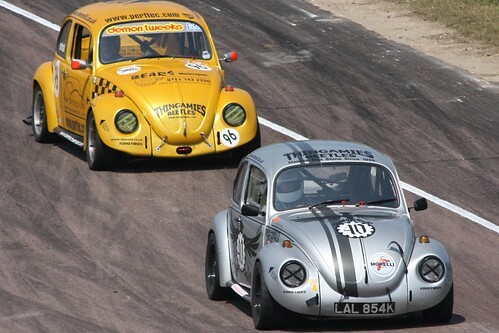 That beetle was raced!! He did not quite manage to get past Dom but it certainly was not through lack of trying it was just the opportunity which was lacking. Dom’s fastest lap 1.54.798 Dave’s 1.54.693. Mallory next where there will definitely be lots of Beetles! 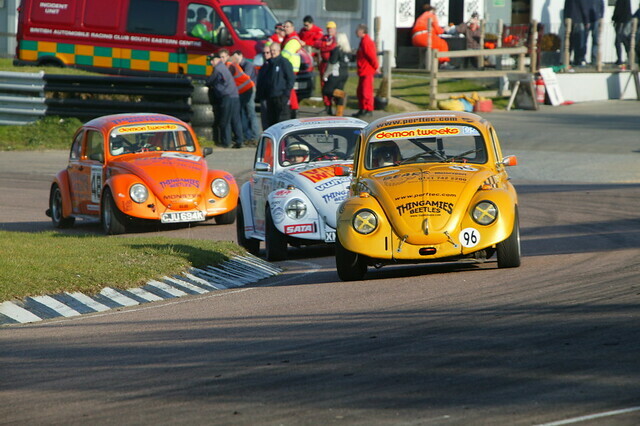 There were 6 Beetles on the entry list the week before this the first race of 2010, but as is the case with racing 1 week to go but 3 weeks work still to do! Race day dawned with 3 cars on the grid to fight it out. Let battle commence. 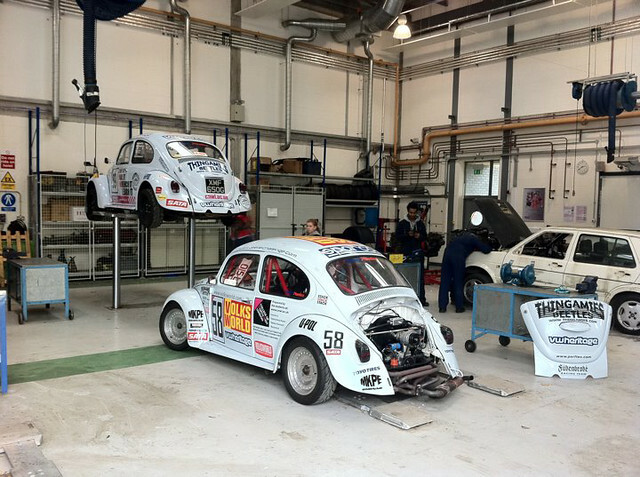 Qualifying saw Dave ‘The Bandit‘ Charlton in his reliable 1600cc ex rally beetle only staying out for 7 laps coming in with a slight smoking problem (Nothing a Nicorette patch and some self-discipline didn’t sort out!). 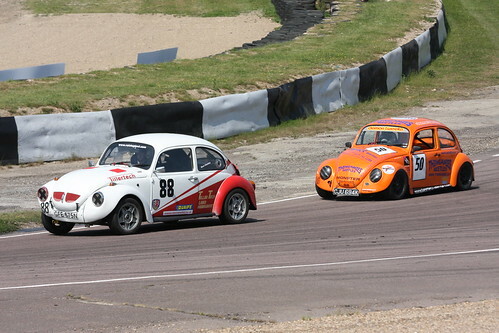 Craig ‘Grandad‘ Winfield in his 1914cc ex beetle cup car and Nick ‘The Vicar‘ Whitty in his 2332cc ex beetle cup car both stayed out for 9 laps. Dave qualified in 1.02.052 Craig in 1.03.031 and Nick in 1.09.841. 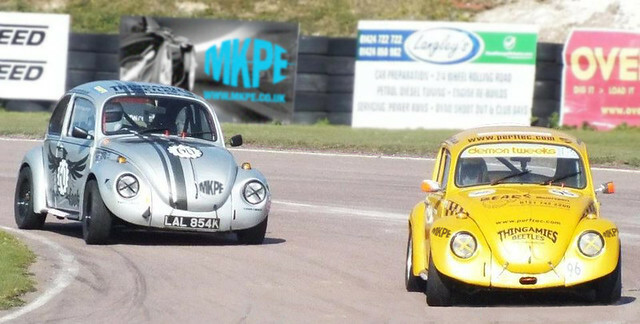 This was Nick’s first time out and the others need to watch out for him as he gains more experience and track time. Race 1 was a good battle and won by Dave (having solved the smoking problem) Craig put up a good chase but was just lacking in enough power to get past Dave (That pesky HP Robbing gearbox… will be sorted for Mallory! so expect some fireworks and more dogfighting!). Their fastest times being 1.02.320 and 1.02.344 respectively!!!. Nick unfortunately had a spin and damaged the exhaust so back to the pits for him. Race 2 was looking like the rain could play a major factor however the hailstones actually held off until 2 minutes after the race finished. Although Nick had managed to get another exhaust on his car he was not happy with it and so decided to withdraw and live to fight another day. 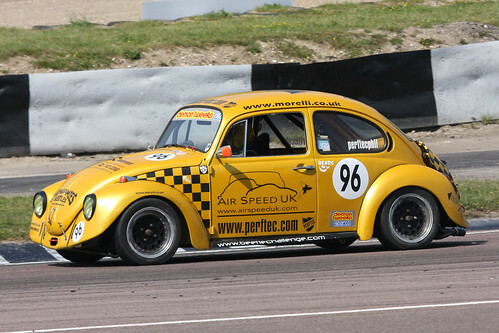 Well done Nick for getting to the grid in the first place and having a go. An achievement in itself. So this left Dave and Craig to again commence battle. This time it was Craig who had a problem (a fire!) Nothing too serious (Exhaust Lagging, oil and heat = ignition!) but obviously the end of his race. 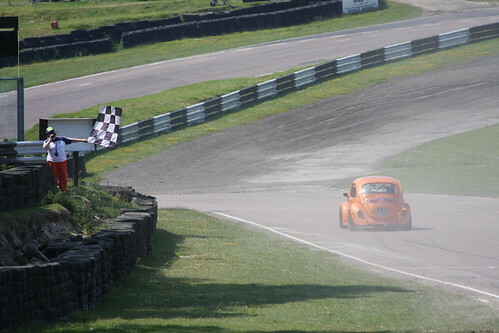 Dave was flying in this race actually doing a fastest lap of 1.01.669 and so taking victory again. 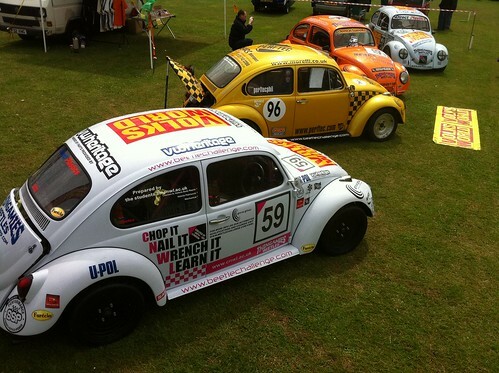 So what happened to the other 3 cars which were registered to race? Simon ‘Monster‘ Sergides: Oh… so close but no cigar! (Gutted) Fresh engine only went in on the Weds before the race.. and then had some gearbox issues… all should be sorted for Mallory. Steve ‘Cookie‘ McV: Was working on his car until the 11th hour… and just needed a few more hours.. (Double Gutted) All done now and ready to race. Lawrence ‘Can I have it for Free‘ Butcher: Only Lemony Snicket has had more unfortunate events.. Rebuilt his engine… raised the compression.. bugger the starter was not man for the job!.. Painted the wings.. and a freak Charlie Brown cloud showered on the not-quite-cured-fresh-paint… end result… Galaxy Aero style paint finish! the list goes on! LoL… but now it’s running, and the once long list of To Do’s has rapidly diminished.. and he’ll be out for Mallory.